"This is a proven method of alleviating fatigue in industries that combine high intensity with long shifts, yet is has been neglected by the one industry that studies sleep. Our results show that a well timed nap can provide a significant boost in physician concentration and take away some of the burden of chronic sleep deprivation." By University of Chicago Medical Center, The first study to assess the benefits of naps for medical residents during extended shifts found that creating protected times when interns could sleep during a night on-call significantly reduced fatigue. Interns on the nap schedule increased their average sleep time by 41 minutes, from 144 minutes a night up to 185 minutes. Interns on the nap schedule who forwarded their pagers to the "night-float" resident increased their sleep times even more, from 142 up to 210 minutes. Sleep efficiency � the ration between time in bed and time asleep � also improved for those on the nap schedule, from 73 percent, considered abnormal, up to 80 percent. 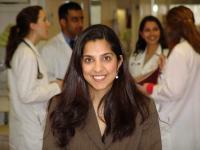 Study author Dr. Vineet Arora and residents at the University of Chicago Hospitals.